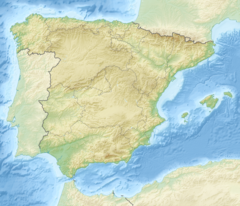 The Atapuerca Mountains (Spanish: Sierra de Atapuerca) is a karstic hill formation near the village of Atapuerca, in the Province of Burgos (autonomous community of Castile and Leon), northern Spain. In a still ongoing excavation campaign, rich fossil deposits and stone tool assemblages were discovered which are attributed to the earliest known hominin residents in Western Europe. 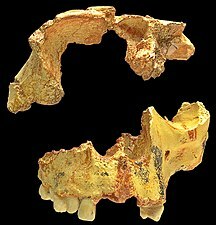 This "exceptional reserve of data" has been deposited during extensive Lower Paleolithic presence, as the Atapuerca Mountains served as the preferred occupation site of Homo erectus, Homo antecessor (or Homo erectus antecessor), Homo heidelbergensis and Homo neanderthalensis communities. The earliest specimen so far unearthed and reliably dated confirm an age between 1.2 Million and 630,000 years. Some finds are exhibited in the nearby Museum of Human Evolution, in Burgos. The site was designated a UNESCO World Heritage Site, under the name, Archaeological Site of Atapuerca. 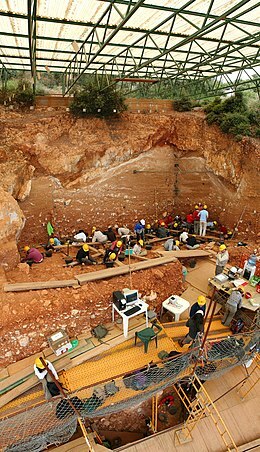 Encompassing 284,119 ha (702,070 acres) or over 1000 square miles, the Atapuerca Mountains are a mid-altitude karstic range of small foothills around 1,080 m (3,540 ft) above sea level. 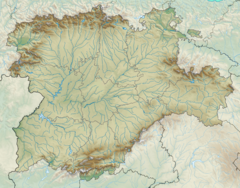 They are located at the north-east corner of the Douro basin, to the south of the Cantabrian Mountains that run across northern Spain, and stretch alongside the Bureba corridor, a mountain pass that connects the Ebro river valley with the Mediterranean Sea and the Duero basin. This conjunction[clarification needed] constitutes an ecotone, which is rich in species of both ecosystems. The mountain pass was part of a causeway built by the Romans, as well as part of the pilgrimage route of Saint James; it is now traversed by the N-I and AP-1 highways. The mountains are strategically located between two major drainage divides and near the mountain pass; this location is assumed to have been a factor in the area's successful and prolonged hominid habitation. In 2008 scholars identified a new genus and species of red-toothed shrew from the Pleistocene layers of the Gran Dolina cave. Until this discovery, researchers had believed that the fossils found in this area were of the Beremendia fissidens type, but recent research has been published to support an Asiatic type called Dolinasorex glyphodon that might be endemic and is the earliest known type of soricid in the Iberian peninsula. 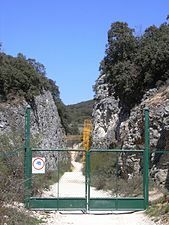 The archaeological significance of the area became increasingly apparent during the construction of a railway line as deep trenches were cut through the rocks and sediments of the Gran Dolina site, the Galería Elefante and at Sima de los Huesos. The subsequent excavation of 1964 under the direction of Francisco Jordá Cerdá succeeded with the discovery of anthropogenic artifacts and human fossils from a broad time range of early humans, hunter-gatherer groups to Bronze Age occupants and modern human settlers. Further campaigns expanded and interdisciplinary work has been undertaken by several teams, led by Emiliano Aguirre from 1978 to 1990 and later jointly by Eudald Carbonell, José María Bermúdez de Castro and Juan Luis Arsuaga. The government of Castile and León has designated the site an Espacio cultural and under the title Zona Arqueológica sierra de Atapuerca the site is protected under Spanish law as it was induced into the Bien de Interés Cultural heritage register. The combined work of archaeologists Jesús Carballo (1910 to 1911), Geoffrey Clark (1971), José María Apellániz (1973 to 1983) and the current team of Juan Luis Arsuaga account for the documentation of the excavation sequence of ceramic objects from all relevant sediment layers since the Neolithic. The Galería de la Eduarda y el Kolora is a local cave that contains parietal rock paintings, only discovered in 1972 by a group of local speleologists. 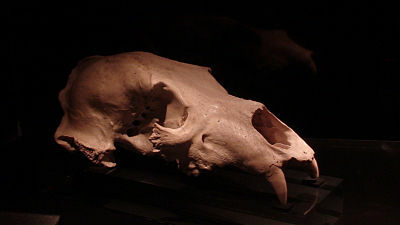 Among numerous faunal and floral fossils a jaw fragment was found during the 1970s and a skull fragment in 1995, which both belong to Homo heidelbergensis. They date to between 600,000 and 400,000 years BP. Level TD-10 presumed to have been a Homo heidelbergensis camp with tools and bison fossils. Level TD-8, accessible since 1994, it contained remarkable carnivore fossils. TD-6 (Aurora stratum): In 1994 and 1995, over 80 bone fragments of five or six hominids found, between 850,000 and 780,000 years old, being at least 250,000 years older than any other hominid yet discovered in western Europe. About 25% of the bones have manipulation marks that suggest cannibalism. Classification of these remains is still being debated, suggestions range from Homo erectus to Homo heidelbergensis and Homo antecessor. Some researchers, who are familiar with the stratigraphic material of Gran Dolina argue that Homo antecessor may be the ancestor of Homo heidelbergensis, who in turn gave rise to Homo neandertalensis. The Homo erectus-like fossils were also found with retouched flake and core stone tools. Level TD-5 is assumed to have been a carnivore den. 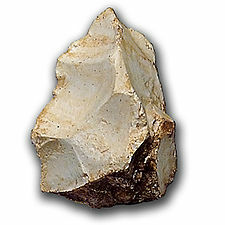 In TD-4 (dated to 780,000 BP), four lithic pieces were found during the 1991 excavation and several remnants of Ursus dolinensis, a sparsely described bear species. Sima de los Huesos (Pit of Bones) accounts for the greatest number of valuable scientific discoveries and knowledge acquired with far-reaching implications. This site is located at the bottom of a 13 m (43 ft) deep shaft, or "chimney" accessible via the narrow corridors of the Cueva Mayor. The complete cranium, Skull 5, nicknamed Miguelón, the fragmented cranial remains of Skull 4, nicknamed Agamenón and Skull 6, nicknamed Rui (a reference to the medieval military leader El Cid). Remains of a child with craniosynostosis were found and dated to 530,000 BP. The find was considered to provide evidence for food sharing in early human populations. Mitochondrial DNA (mtDNA) from a 400,000 year old femur has been sequenced, the oldest hominin mtDNA recovered as of 2013. The mtDNA was found to be closer to the mtDNA of Denisova hominins than to the mtDNA of Neanderthals. In 2016, nuclear DNA analysis results determined the Sima hominins to be Neanderthals and not Denisova hominins, and the divergence between Neanderthals and Denisovans predates 430,000 years. Some excavators have stated that the concentration of bones in the pit allows the suggestion of a traditional burial culture among the cave's inhabitants. A competing theory cites the lack of small bones in the assemblage and suggests that the fossils were washed into the pit by non-human agents. According to José María Bermúdez de Castro, co-director of research at Atapuerca, the Sima del Elefante findings support "anatomical evidence of the hominids that fabricated tools more than one million years ago", which may have been the earliest among Western European hominids. The first discovery in June 2007 was a tooth followed by a fragment of a jawbone and a proximal phalanx in 2008. This site provides information on earliest local farmers and herders of the late Neolithic and Bronze Age. Stone tools of the Upper Paleolithic have been extracted from this locality. Piedrahita ("standing stone") in the Atapuerca valley is according to records site of the Battle of Atapuerca, which took place in 1054 between the forces of Ferdinand I of Castile and his brother García V of Navarre. Apart from the typical dryland farming of the region, the municipality has grown significantly in economic, demographic and social level with the impact generated by the presence of the archaeological site and its associated services. 15% of the active population owns a job related to tourism. This "tertiarization" of their economy has reversed depopulation by growing and rejuvenating it (with the average age at 42 years). ^ "Homo heidelbergensis: Evolutionary Tree information". Smithsonian National Museum of Natural History. Retrieved January 26, 2017. ^ "Archaeological Site of Atapuerca - UNESCO World Heritage Centre". Whc.unesco.org. Retrieved January 26, 2017. ^ "Landforms And Geomorphological Processes In The Duero Basin. Pleistocene Geoarcheology Of Ambrona And Atapuerca Sites" (PDF). Geomorfologia.es. Retrieved January 27, 2017. ^ Arsuaga, Juan (2004-03-25). The Neanderthal's Necklace: In Search of the First Thinkers - Juan Arsuaga - Google Books. ISBN 9781568583037. Retrieved January 26, 2017. ^ ". Geographic setting of the Sierra de Atapuerca and map of the... - Figure 1 of 14". researchgate.net. Retrieved January 26, 2017. ^ "No. 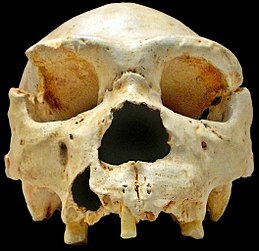 2516: Atapuerca". Uh.edu. Retrieved January 26, 2017. ^ "MEMORIA del Espacio Cultural "Sierra de Atapuerca"" (PDF). Jcyl.es. Retrieved January 26, 2017. ^ "Prehistoric skull with puncture wounds could be world's first murder mystery". Msn.com. Retrieved January 26, 2017. ^ Greenspan, Stanley (2006-02-07). How Symbols, Language, and Intelligence Evolved from Early Primates to Modern Human. ISBN 978-0-306-81449-5. ^ "Excalibur, the rock that may mark a new dawn for man". The Guardian. January 9, 2003. Retrieved January 26, 2017. ^ "Craniosynostosis in the Middle Pleistocene human Cranium 14 from the Sima de los Huesos, Atapuerca, Spain". Pnas.org. Retrieved January 26, 2017. ^ Callaway, Ewen. "Hominin DNA baffles experts". Nature.com. Retrieved 8 December 2013. ^ magazine, Ewen Callaway,Nature. "Oldest Ancient-Human DNA Details Dawn of Neandertals". Scientific American. Retrieved 2016-03-14. ^ Meyer, Matthias; Arsuaga, Juan-Luis; de Filippo, Cesare; Nagel, Sarah; Aximu-Petri, Ayinuer; Nickel, Birgit; Martínez, Ignacio; Gracia, Ana; de Castro, José María Bermúdez (2016-03-14). "Nuclear DNA sequences from the Middle Pleistocene Sima de los Huesos hominins". Nature. 531 (7595): 504–507. doi:10.1038/nature17405. ISSN 1476-4687. PMID 26976447. ^ "'First west Europe tooth' found". BBC News. 2007-06-30. ^ "Creation of economic and demographic development [Social Impact]. ATAPUERCA project". SIOR. Social Impact Open Repository. 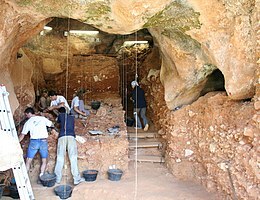 Wikimedia Commons has media related to Atapuerca.